Denis McKim, Boundless Dominion: Providence, Politics, and the Early Canadian Presbyterian Worldview (Montreal and Kingston: McGill-Queen’s University Press, 2017). Writing about Wesleyan Methodism in Canada, or most anywhere else in the world for that matter, obliges the dutiful historian to begin with the founding moment at ‘about a quarter before nine’ on the evening of 24 May 1738, when John Wesley felt his heart ‘strangely warmed.’ Scholars of Presbyterianism in Canada seem equally obligated to quote from Stephen Leacock’s satirical masterpiece, Arcadian Adventures with the Idle Rich. In that book, as Denis McKim notes, Leacock, with malicious glee, tells the story of the ‘Presbyterian church of St. Osoph’: a ‘quarrelsome…congregation’ that had ‘severed its ties to virtually every other Presbyterian group due to an elaborate series of disputes’ (McKim, 3). As with all the best satire, there is more than a little truth to Leacock’s portrait of denominational factiousness; it was a characteristic that metropolitan and colonial Presbyterianism shared with other Anglo-American Protestant groups and that became especially acute during the mid-nineteenth century. That period witnessed devastating divisions among English, Scottish, Canadian, and American Protestant churches, including both established and dissenting denominations in Britain and its colonies. And yet, by the 1870s, this process of schism had been transformed into one of growing unity, at least among the Protestants of the newly-created Dominion of Canada. While not ignoring the complex divisions among Presbyterians in Britain and British North America, in this book McKim emphasises the deep cultural roots of that later period of unity. In doing so, he positions Canadian Presbyterians at the centre of a series of constantly evolving and interacting transatlantic worlds. McKim makes the case that historians have overplayed ‘the caricature of the impossibly prickly Presbyterian’ (McKim, 4). As I have noted, to do that, he stresses those cultural forces that drew Canadian Presbyterians together, even while they were coming to (rhetorical) blows over political issues like the clergy reserves of Upper Canada. In particular, McKim stresses the unifying impact of the Canadian Presbyterians’ conception of their providential denominational and British imperial missions; their opposition to slavery and to Roman Catholicism; and their increasing zeal to create a godly form of politics and society in British North America. 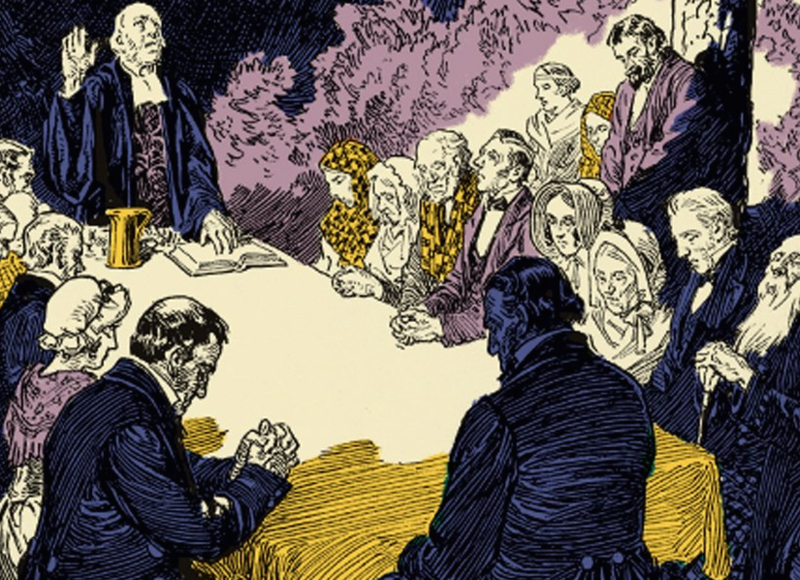 To achieve that final lofty goal, Presbyterians set to work combatting the moral wilderness they found in colonial Canada, encouraging ‘humanity’s divinely ordained duty to achieve dominion over nature’ (McKim, 199) while also applying and exercising denominational discipline and other Presbyterian ecclesiastical traditions. All of this was tied together, McKim argues, by the Canadian Presbyterians’ sense of themselves as actors in a great historical drama, stretching back to ancient Israel and destined to end in the near or distant future in a millennium presided over by a suitably stern Calvinist God. Even those raucous political battles that pitted members of the three main Presbyterian traditions that took root in British North America – Church of Scotland, Secession, and Free Church – against one another were shaped by these forces, and by the continuing transatlantic links between metropolitan and colonial Presbyterianism. The same can be said, McKim notes, of the Canadian Presbyterians’ coming together around the notion of a moral establishment: a Christian commonwealth policed by laws intended to promote godliness. In a style that would have been familiar to other Protestant denominations in British North America, Presbyterians made skillful use of the rhetoric of Britishness to advance and defend arguments in favour of their pet political projects. McKim carries off this complicated argument with scholarly panache. His arguments are backed up with solid primary research and a firm command of the relevant secondary literature on the religious and imperial contexts of the story that he is telling. There is, nevertheless, one quibble I have with McKim’s wide-ranging approach to the Presbyterian worldview. My own work on the Wesleyan Methodists of nineteenth-century Ontario and Quebec stresses the sometimes-chaotic day-to-day negotiation of British and Wesleyan identities – a conflict that led to actual, in addition to rhetorical, violence on both sides of the Atlantic. That story, too, ended in a cultural unity of the type described in McKim’s book. But, by concentrating on what Presbyterians thought and felt, rather than on what they did, McKim loses something of the life of his subjects – the passion that led them repeatedly to the denominational barricades in order to combat other churches and sometimes their fellow Presbyterians. To be sure, hints of that zeal for ecclesiastical battle come out in the chapters dealing with politics: the example of Peter and George Brown growling in the early 1840s about colonial Tories behaving like ‘Roman and High Church Priests, and Jacobite bigots’ will certainly be prized by collectors of early-Victorian rhetorical overkill (McKim, 150). And McKim’s consistently even-handed treatment of his subjects cannot entirely disguise the fact that some of these colonial Presbyterians were first-class cranks. That was what Stephen Leacock was driving at when he wrote about a Presbyterian minister going courting with ‘the History of the Progress of Disruption in the Churches of Scotland in ten volumes,’ a joke that McKim does not include in his book. This criticism is a matter of approach and emphasis more than anything else. There are advantages to either form of analysis. I hope that my Transatlantic Methodists conveys a sense of the Wesleyan Methodists in all their wild, eccentric glory, but McKim’s Boundless Dominion does a much better job of explaining how the equally factious Canadian Presbyterians achieved denominational unity in the mid-1870s. Concentrating on the longue durée of metropolitan and colonial Presbyterianism allows McKim to explore and explain the forces of cultural gravitation that pulled his subjects together, even in the troubled, schismatic times of the mid-nineteenth century. In doing so, this book takes a place of honour among a growing number of works that are rethinking the place of Canada’s pre- and post-Confederation churches in the wider transatlantic world. Todd Webb is an associate professor in the Department of History at Laurentian University. He is currently working on a study of what he is tentatively calling the ‘mid-nineteenth century crisis in Anglo-American Protestantism,’ concentrating, in particular, on the Wesleyan Methodist experience. You can find him online with Laurentian History. W. Reginald Ward and Richard P. Heitzenrater, eds., Works of John Wesley: Journals and Diaries (Nashville: Abingdon Press, 1988), 18:249-50. Todd Webb, Transatlantic Methodists: British Wesleyanism and the Formation of an Evangelical Culture in Nineteenth-Century Ontario and Quebec (Montreal and Kingston: McGill-Queen’s University Press, 2013). Stephen Leacock, Arcadian Adventures with the Idle Rich (Toronto: McLelland & Stewart, Ltd., 1989), 167.